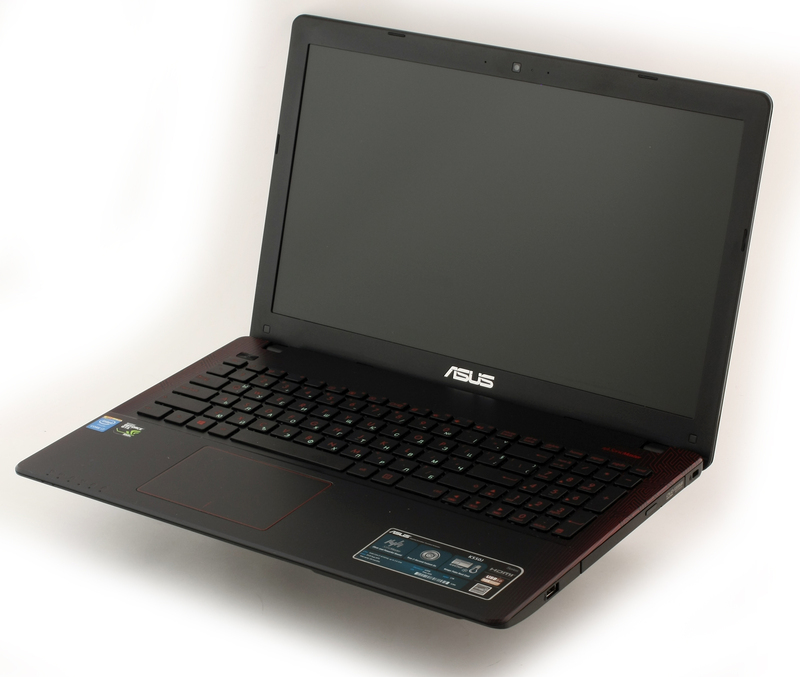 And yet another budget notebook that’s aimed for gaming was in our lab – ASUS K550JX. At first glance of the specs sheet, it can easily be mistaken with the old version of GL552, which we reviewed a few months back. 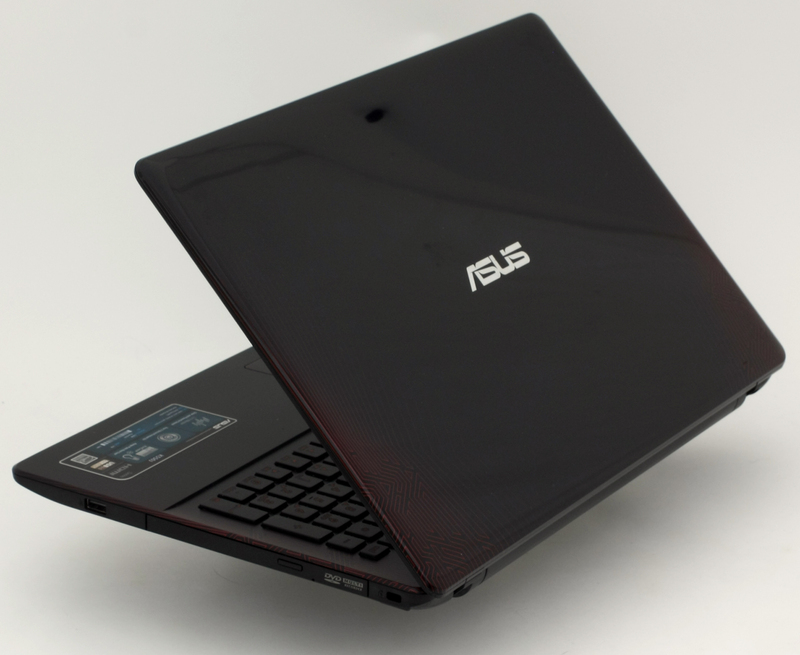 But besides the CPU and GPU, from design to hardware, both notebooks are totally different. Of course, with a price difference of €100, the K500JX compromises in screen quality and keyboard backlight., but the gap should have been filled after the GL552 became more expensive with better hardware. However, we are not here to talk about the difference between the old GL552 and the K550JX but to see if the machine can handle more serious gaming. Despite the machine not being part of the ROG (Republic of Gamers) lineup, the GPU (GeForce 950M) and CPU (Intel Core i7-4720HQ) paired with 12GB DDR3 RAM suggest otherwise. There’s a little red pattern on the back and on the interior of the notebook hinting the ROG inheritance. At this price the offering is lucrative, but what about the display quality? Let’s find out. 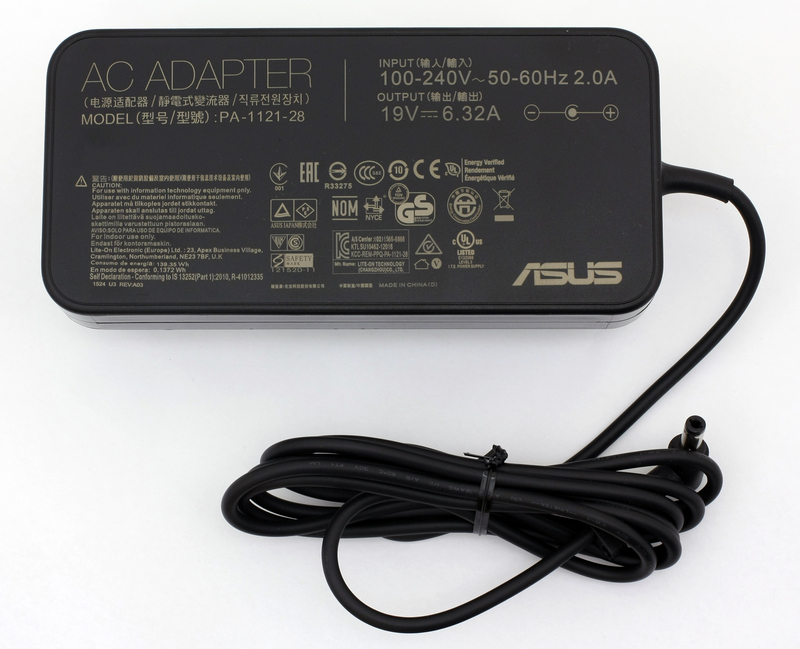 The package doesn’t offer anything out of the ordinary besides the usual user manuals, DVD with drivers, the AC adapter, and charging cable. As a notebook at this price range with relatively powerful hardware, there isn’t much to be expected in terms of build quality. We are somewhat left with mixed feelings about the construction and design. 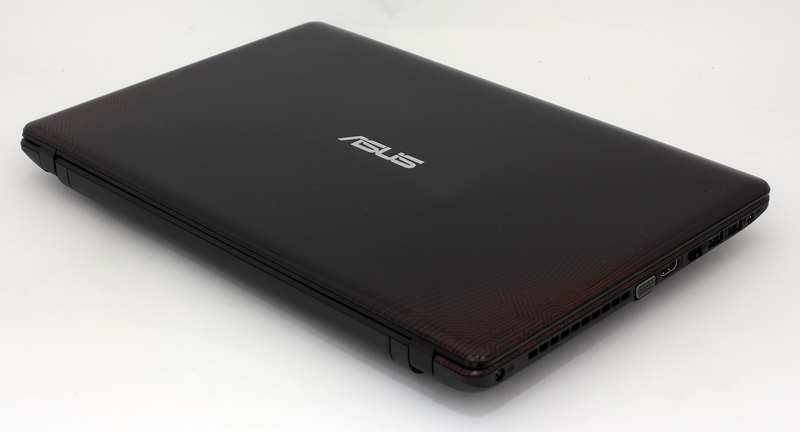 The lid is made of glossy plastic with ASUS’ logo in the middle and while the better part is in black, there are little red stripes and patterns on the back. We definitely liked those and kind of reminds us of the same pattern used for ASUS GL552JX’ chassis. Applying pressure on the back causes big ripples on the screen, so leaving heavy objects on the lid isn’t advisable. 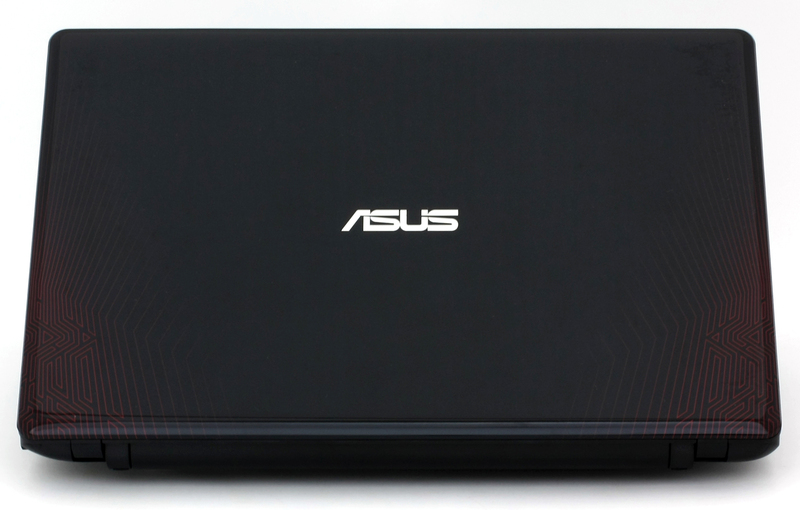 On the other side of the lid, you will find the 15.6-inch screen with ASUS’ logo at the bottom. Bezels are relatively thin and the top one houses the built-in webcam. The bottom also kind of resembles the GL552 using the same hard plastic cover and small service cover that hides the most common upgrade options like RAM and 2.5-inch drive. The rest of the bottom side includes extra vents for more airflow that can be used with an additional cooling pad. As we go around the sides, which are quite thin, we find all the usual ports and connectors. The left side accommodates the main vent for dispersing the heat, DC charging port, VGA, HDMI, RJ-45, 3.5 mm audio jack and two USB 3.0 ports. This means that the most commonly used ports are placed on the left and this will surely help using an external mouse in small workspaces better. As for the right side, it’s pretty clean – only one USB 2.0 port and the optical drive. Opening the lid reveals the interior that will surely make you think of a ROG notebook. The same red stripes and patterns are placed on the plastic surface around the keyboard, the keyboard itself is in red, but there’s no LED backlight. Yes, most of the users type without looking at it, but the one time you will need to find a specific “Fn” key or the volume buttons will be a hassle. Some other variants on the market do include LED keyboard backlight and the same would have been appreciated here. 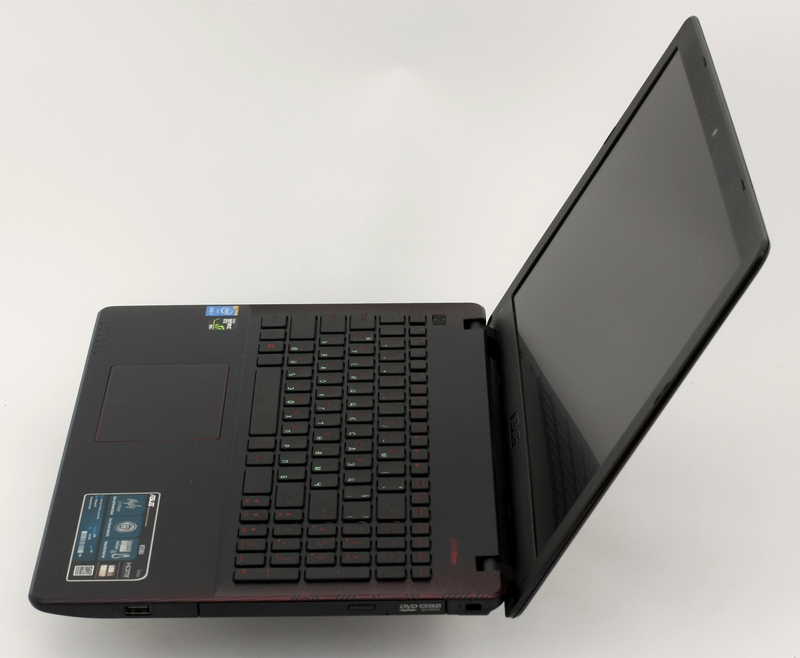 We are not sure if this notebook is aimed for multimedia or gaming, but in both cases two important factors are missing – IPS LCD screen and LED keyboard backlight. Still, for the price point we can’t be too picky. Going back to the keyboard – keys feel okay with enough travel and good tactile feedback, but nothing too special. The touchpad is mostly good for the price of the K550JX – it’s responsive, accurate, but a bit stiff. Clicking is a challenge at times so bigger pressure has to be applied for the trackpad to register a mouse click. At least it doesn’t wobble as the one on the old version of GL552. While the design is appealing, the keyboard is comfortable, the sides are relatively thin and the pattern on the back looks cool, there are some things that cannot be overlooked – the glossy finish is a fingerprint magnet (the interior as well), doesn’t feel sturdy enough and the plastic used for the lid and interior bends like crazy. That’s the compromise you have to make for a decent hardware that’s capable of running some of the latest games. 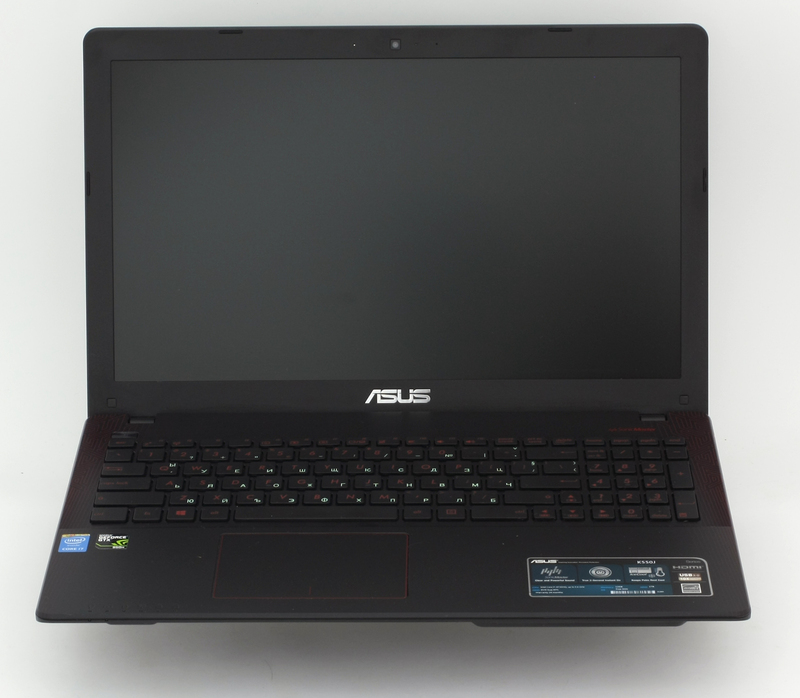 ASUS K550JX uses a Full HD TN panel with model number N156HGE-EAB manufactured by INNOLUX. It also has anti-glare hard coating (3H) in a 15.6-inch diagonal size and 16:9 aspect ratio. With a resolution of 1920 x 1080, the panel has a pixel density of 141 ppi and pixel pitch of 0.18 x 0.18 mm. It can be considered as “Retina” if viewed from a distance equal or greater than 61 cm. Due to the TN panel, K550’s display has poor viewing angles as you can see from the image below that represents a 45-degree incline. The maximum recorded brightness is 214 cd/m2 with a deviation of only 8% while the average color temperature on the surface of the screen is 7190K – daylight type of light, colder than the optimal one of 6500K(D65), but still close enough. No unacceptable deviations. The yellow triangle represents the color gamut coverage that the display has and it’s only 50% sRGB in this case. Below you will see practically the same image, but we’ve adjusted the screen brightness to 140 cd/m2. Color circles represent the reference colors and white circles being the result. You can see main and additional colors with 100% and 50% saturation inside the sRGB gamut. We’ve set the display at 140 cd/m2 brightness and color temperature to 6500K. We used X-Rite i1Display Pro for profiling. Below you can see the results from the accuracy color checker with 24 commonly used colors like light and dark human skin, blue sky, green grass, orange etc. After profiling the color accuracy, average DeltaE 2000 = 1.69, good result, but the contrast ratio fell from 350:1 to 170:1 after calibration. Both results aren’t good at all. On the image below are another batch of colors we’ve tested. On contrary to the previously mentioned results, the display passed our PWM test with flying colors. We didn’t record any screen flickering across all brightness levels. The lowest frequency of the emitted we were able to detect was 26 kHz and it’s present only at the lowest brightness level, which is practically unusable. Still, even 26 kHz is considered to be really high and will not cause eye fatigue or headaches. While some of the values from the sRGB color gamut coverage, contrast ratio, maximum brightness and the viewing angles aren’t the best we’ve seen, there are some properties that are worth considering. Firstly, the display offers Full HD resolution, relatively accurate color reproduction after calibration and there’s no PWM across all brightness levels. The screen would be useful to users that don’t need accurate color reproduction for design-related tasks, but will suit well for gaming and web browsing. The sound quality is overall good at high and mid frequencies, but it’s not as satisfying at lower frequencies. The results we got from our battery tests are somehow good for this price range and available hardware. With the same CPU and GPU as the GL552, but with more efficient TN panel, the K550JX got a tad better readings in our tests, despite the lower battery capacity, which, in this case, is 4-cell and rated at 37Wh (2600 mAh). All tests were performed under the same conditions – Wi-Fi turned on, screen brightness set to 120 cd/m2 and power saver mode is on. Better than average – 253 minutes (4 hours and 13 minutes). Slightly lower result here, but still acceptable – 211 minutes (3 hours and 31 minutes). We got only 50 minutes on this one, but it’s quite normal given the price range, battery capacity, and the power-hungry hardware. It’s quite unlikely to start a gaming session away from the power source, though. Here you can see an approximate comparison between the CPUs that can be found in the ASUS K550 (F550) models on the market. 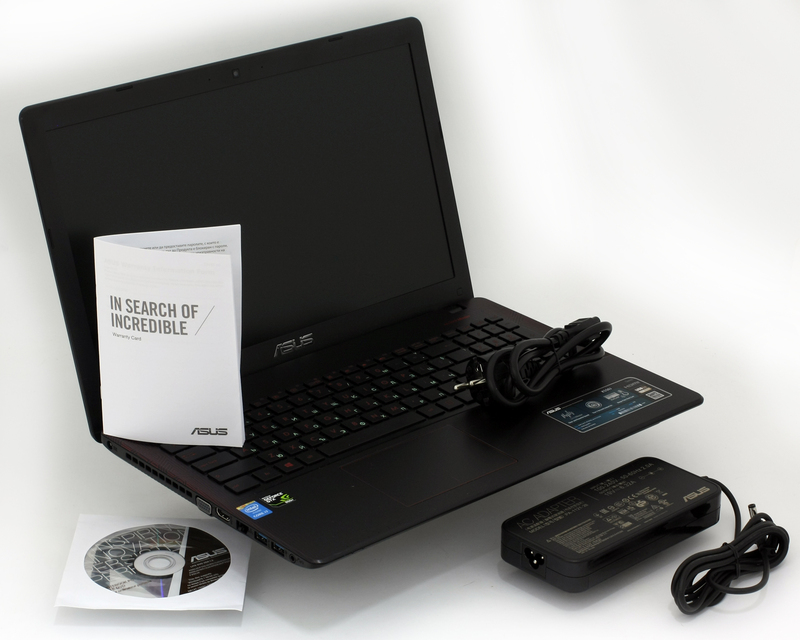 This way you can decide for yourself which ASUS K550 (F550) model is the best bang for your buck. Fritz is a chess benchmark which tests the computing capabilities of the CPU with various chess moves. 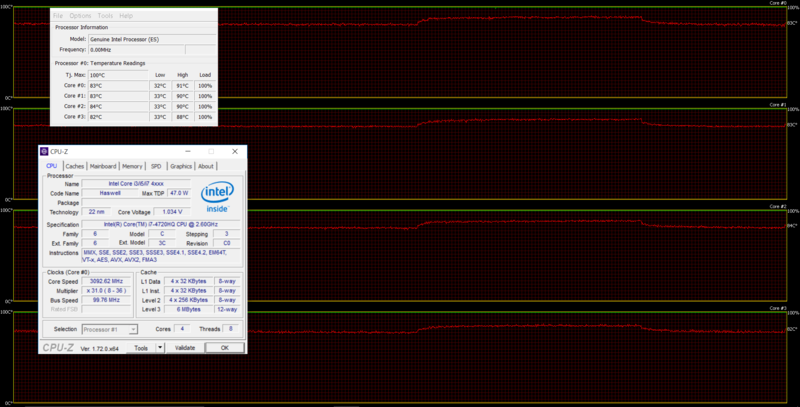 The Intel Core i7-4720HQ managed to get 13.025 million moves per second. For comparison, one of the most powerful PCs, Deep(er) Blue, was able to squeeze out 200 million moves per second. In 1997 Deep(er) Blue even beat the famous Garry Kasparov with 3.5 to 2.5. However, the memory width is 128 bit with 16 ROPs, 40 texture units and 640 CUDA cores (or shading units). It als features increased L2 cache size, which is now 2MB. Supports features like Battery Boost, GameStream, ShadowPlay, GPU Boost 2.0, Optimus, PhysX, CUDA, SLI and GeForce Experience. Here you can see an approximate comparison between the GPUs that can be found in the ASUS K550 (F550) models on the market. 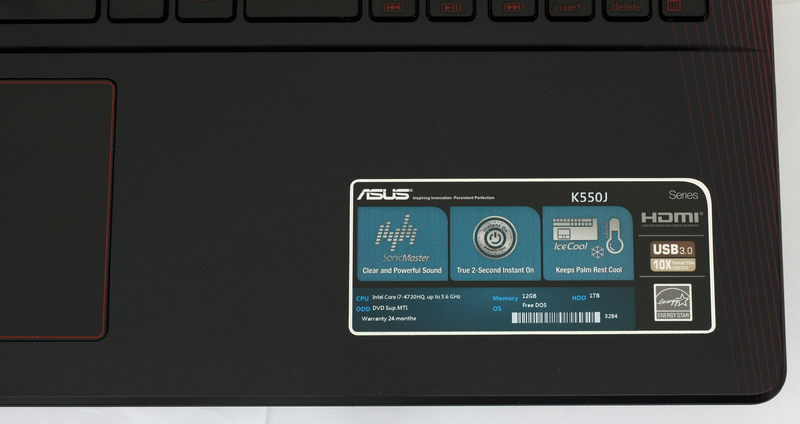 This way you can decide for yourself which ASUS K550 (F550) model is the best bang for your buck. This is an important part of the review where we check the performance of the cooling system and the overall stability of the notebook under heavy load and in the long run. However, 100% CPU and GPU usage are virtually impossible under normal exploitation by the general user. We start off with 100% CPU load for about an hour and the readings we got from the first part of the test look promising. The CPU ran at around 83 °C after cooling down from 91 °C and maintained frequency above the base one – 3.1 GHz. This means that no throttling occurs under heavy load and the fans do their job just fine. After one hour, we turned on the GPU stress test alongside the first one and things took a drastic turn. The CPU started throttling not long after the GPU started working full time and there were constant spikes between 800 MHz and near 2.5 GHz, caused by the high inner temperatures. That’s why on the graph below shows lower CPU temperatures – it’s because the CPU’s performance has dropped in favor of the GPU. Despite the CPU throttling, we didn’t see any problem with the GPU and overheating whatsoever. Here’s how the interior looks during heavy load and as you can see temperatures didn’t exceed 40 °C, with this being a good result. You won’t feel any excessive heat on the surface except for the middle part of the keyboard, but still the heat is bearable, but most importantly – you won’t feel discomfort. Even if the K550JX isn’t part of the ROG family, it sure does serve as a good replacement of the previous generation GL552JX. It has powerful hardware for the asking price little more than €800 but lacks the cool IPS panel that the GL552JX offered (or still offers if you can find at any retailer). The GL552JX offered IPS panel for almost exactly the same price as the K500JX sells now, so this can be considered as a major drawback. The presented panel here has low maximum brightness, low contrast ratio, not enough sRGB color gamut coverage and poor viewing angles, yet we recorded no screen flickering across all brightness levels, which is a nice addition that’s rarely seen at this price point. But it’s actually your only option if you don’t want to opt for the significantly more expensive GL552VW with GTX 960M and Core i7-6700HQ. Other than that, the notebook offers fairly good build quality at this price range with little setbacks, powerful hardware capable of running some of the latest games, relatively durable battery, and nice keyboard with responsive touchpad, with the latter being a little on the stiff side when using mouse buttons, though. Also, the keyboard doesn’t offer LED backlight and may cause some inconvenience when playing or working in a poorly lit room. We want again to stress that the GL552JX offered LED keyboard backlight, yet worse touchpad quality. Yet, the notebook will serve as a perfect solution for software engineers, for example, due to the powerful Core i7-4720HQ CPU and 12GB of RAM, not to mention the flicker-free display that won’t cause eye fatigue or headaches during long working sessions. The latter might be a deal-breaker for some. So at the end of the day, you have to give up some perks like a good IPS panel and build quality for a more powerful hardware, but if you are planning on using the machine with an external display most of the time – go for it. The K550JX is a great performer in the mid-class range. I have k550j with i7, 950m and 12gb of ram. I didn’t tested it much. What I noticed so far, temperature could be a big problem. I also bought extra fan stand, and when laptop is heavy loaded, internal temperatures are around 70-80° which is a lot.. Very hot air blows out of the laptop. I’m afraid laptop wont last long under so high temperatures :/ Beside that, laptop is very good. I miss backlight keyboard. Those red buttons are hard to see in the night. Thank you for your question, Millhouse! How long have you been using the laptop? Sometimes particles enter the interior and can cause similar issues. If your warranty is still applicable, you can contact the shop you bought the machine from. If not, you can take it to a specialized service center where you will have it opened and serviced properly. I hope that my reply is somewhat helpful! Does it have a slot for a SSD? I did not quite understand this part. Looking into this laptop, real good spec for the price, however the 1TB HDD 5400rpm kinda bugs me, with a SSD slot for upgrade it would suit me perfectly. 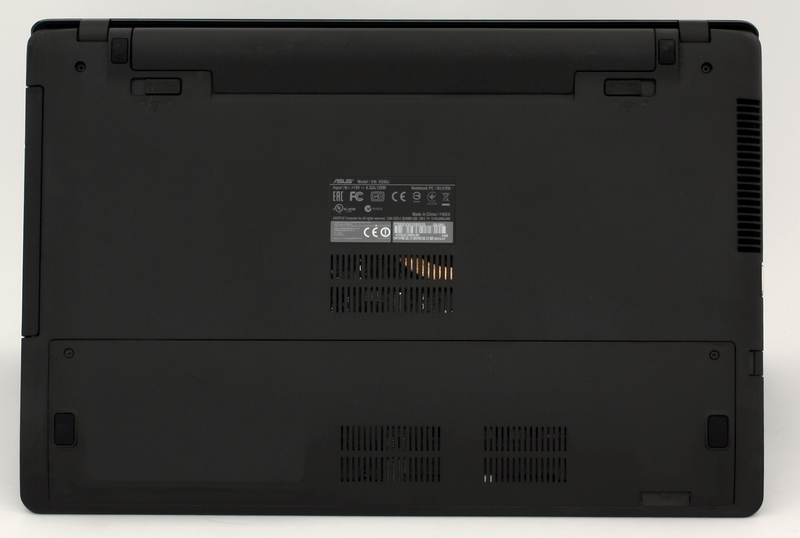 If you are looking for an m.2 slot – no the laptop doesn’t support those. But you can always swap the 2.5-inch HDD for 2.5-inch SSD. Yeah i get that, what i’m looking to find out is if this laptop has 2 slots for a hdd (or ssd) or do i need to remove the current 1tb hdd in order get an ssd inside? You can swap your optical drive for a caddy and fit inside a standard 2.5-inch HDD (probably your current one). And then, you can fill your SATA III slot with a 2.5-inch SSD. This way you can have two drives but at the expense of the optical drive. Thanks for clearing it up. Was hoping to fit in a SSD with the 1TB HDD already inside without losing the optical drive. hy guys, i have the same computer but i would like to know for the ram , i want to increase it until 16 go(or more if i can).Then which ram(brand or …) have i to take,? The keyboard seems more than fine (despite the absence of LED backlight) . How to use it i can understand ? Where I can get the new battery for it? My battery always shows 88%.